Better Button - Knowledge Base - How can I duplicate a button? Knowledge Base Frequently Asked Questions How can I duplicate a button? You may find that you have a single button you'd like to test a few different variations of. Instead of rebuilding the button from scratch each time and trying to get the settings to match, you can simply duplicate the button with all of its settings and then . tweak the new copy to create your variations. If you'd like to make a copy of a button, navigate to the "Buttons" screen and click the icon with 3 dots to the bottom left of the button you'd like to duplicate. You will then be given the option to name your new button. Click "Ok" and your button will be copied. You will be directed to the button studio where you can make changes to your new button. 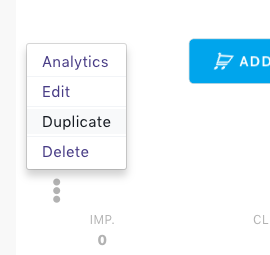 Keep in mind that duplicating a button does not automatically add it to a campaign.